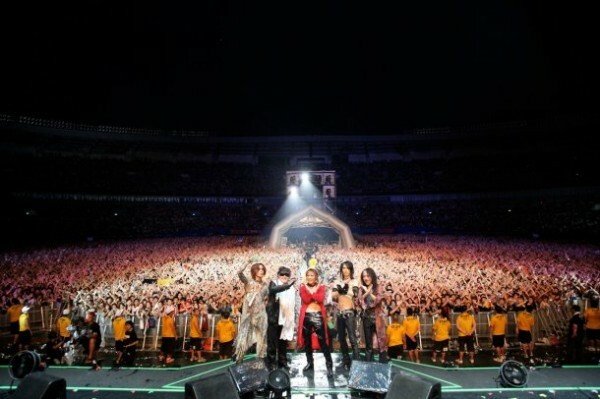 On August 14th, legendary rock band X JAPAN made an appearance at the 'SUMMER SONIC 2011' rock festival, where they played a 70-minute live on the MARINE STAGE at QVC Marine Field in Chiba. X JAPAN held a press conference prior to the concert and expressed their thoughts on the live. Although the band performed at 'SUMMER SONIC 2011' in Osaka the day before, the members showed no signs of weariness. YOSHIKI (drums, piano) kicked off the press conference� bysaying, "It's been over 20 years since the band formed, and I never thought we would be appearing at an international event like this today. I am deeply moved." Then ToshI (vocal) expressed his thoughts on the Osaka performance with, "It's been awhile since we performed as X JAPAN in Kansai, so it was very good." Additionally, YOSHIKI presented a silent prayer for deceased members HIDE (guitar) and TAIJI (bass), as well as for the lives lost in the Great Tohoku Earthquake. When asked, "Hasn't it been awhile since you held a live in Chiba? ", YOSHIKI replied, "This is Chiba! ", with a surprised look. The conference proceeded with a peaceful atmosphere as�PATA (guitar) and ToshI shared nostalgic stories of the past. YOSHIKI voiced his thoughts on the live with, "I want to revive yesterday's reflections," and "When we perform overseas, we're away so we feel at ease, but in Japan, we get nervous. However, I want to face the battle." At the end of the conference, the band announced that they would be holding an Asia tour this fall. They also explained that their new album is making good progress, saying, "99.5% of it is done. We are planning to release it by the end of the year." Immediately after the press conference, X JAPAN went to their stage, and sang a total of seven songs, including their newest, "JADE", along with their classic hits, "ENDLESS RAIN"�and "Rusty Nail". ToshI kicked off the live by yelling, "I wanted to see you, Summer Sonic! Everyone, fire yourselves up til the very end! "; a big display of flames and fireworks boosted everyone's spirits as they burst above the stage. Before the band sang "Kurenai", SUGIZO (guitar, violin) and YOSHIKI performed a splendid duet on violin and piano, fascinating their fans. During the MC portions, ToshI stated, "Everyone, thank you. It's been awhile since we returned to Japan, but as I thought, it's great." YOSHIKI also commented, "Japan is hot. Really hot... I am very honored to be a part of this wonderful event. Thank you to all those who came. I really appreciate it." He continued, "I know that HIDE and TAIJI are here with us today." Additionally, YOSHIKI asked the audience to have a moment of silence for the lives lost in the Great Tohoku Earthquake. He stated, "There are many problems left behind for both us and the country, but we have to overcome it with spirit," and shouted, "Show your spirit!" The second half of their performance started with the peaceful hit, "ENDLESS RAIN". Then ToshI yelled, "Show us your seriousness!" and heated up the crowd with "Born to be free", which was accompanied by an enthusiastic display of laser beams and flames. The last song was "X". The intro started as ToshI shouted, "Show us your Japanese spirit! ", and the crowd broke out into loud cheers. HEATH (bass), PATA, and SUGIZO gathered to the middle of the stage, and gave fans a wild burst of their profound playing. During the song, ToshI called out, "We are...? ", and the fans screamed in unison, "X!" At the end, X JAPAN shook the stage with a grand 'X Jump', concluding their first appearance in 'SUMMER SONIC' with a grand flourish. Take a look at the full setlist and the Asia tour dates below! Also, check out photos from the press conference and 'SUMMER SONIC 2011'! 'Music Japan' reveals all-star girls lineup for August 21st!